A projection or break changing the thickness or width of a piece of shaped wood, metal, or stone. of man, the segment of the upper extremity closest to the trunk. The shoulder is bounded above by the shoulder joint and below by the elbow joint. The base of the shoulder is formed by the humeral bone, which has a body, an upper joint surface (caput, or head) to unite with the shoulder blade, and a lower joint surface (trochlea of the humerus) to unite with the bones of the forearm. The part of the bone under the head is called the neck of the shoulder. The shoulder bone is surrounded by longitudinally situated muscles—biceps and brachialis in front and triceps in back. The muscles are covered by a layer of connective tissue, subcutaneous fatty tissue, and skin. Deep in the soft tissues of the muscles are the blood vessels and nerves—the humeral artery and veins and the radial, ulnar, and median nerves. Superficial nerves, arteries, and veins are situated in the subcutaneous tissue. Traumata of the shoulder include injuries to muscles, tendons, nerves, and blood vessels, as well as fractures—most commonly of the neck of the humerus. The area of union between the upper limb and the trunk in humans. The corresponding region in other vertebrates. The portion of a shaft, a stepped object, or a flanged object that shows an increase of diameter. A projection made on a piece of shaped wood, metal, or stone, where its width or thickness is suddenly changed. A short, rounded spur protruding laterally from the slope of a mountain or hill. The sloping segment below the summit of a mountain or hill. A bench on the flanks of a glaciated valley, located at the sharp change of slope where the steep sides of the inner glaciated valley meet the more gradual slope above the level of glaciation. A joint structure on a joint face produced by the intersection of plume-structure ridges with fringe joints. That part of a plate or type that extends beyond the actual printing surface. 1. A projection or break made on a piece of shaped wood, metal, or stone, where its width or thickness is suddenly changed. Also called ear, elbow. 2. The surface bordering a road, esp. where a vehicle can be parked in emergency. 3. The angle of a bastion included between the face and the flank of a fortification. Also called shoulder angle. 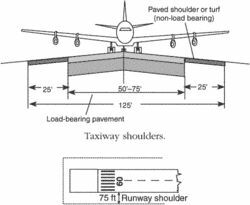 An area adjacent to the edge of a pavement so prepared as to provide a transition between the pavement and the adjacent surface (ICAO).